This ain't your typical tuna salad! 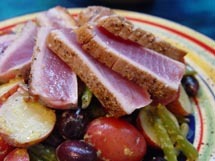 A rosy tuna steak is quickly seared in a hot pan and thinly sliced before being put on display over a hearty potato and green bean salad. Begin by cooking the potatoes. Bring a large pot of salted water to the boil over medium-high heat. Slip in the potatoes and simmer until tender enough for a fork to pass through easily, 5-10 minutes. Alternatively, steam the potatoes in a stovetop steamer. Remove the potatoes and set aside. Next, add green beans to the pot or steamer. Cook until bright green and still slightly crisp, 2-3 minutes. Immediately plunge the beans into a bowl of ice water to stop the cooking and preserve its vibrancy. In a large bowl, whisk together the toss together the potatoes and green beans along with the olives, olive oil, mustard, lemon zest and juice. Season with salt and pepper. Mix gently with a wooden spoon to ensure all the ingredients are evenly distributed and lightly coated with the dressing. Divide the salad base evenly between 4 serving plates. Heat a splash of vegetable oil in a cast iron or sauté pan over medium-high heat. Rub both sides of tuna steak with salt and pepper. When the pan is hot, sear the tuna for 2 minutes per side, creating a golden brown crust while keeping the middle rare. Thinly slice the tuna and drape over the potato salad base, fanning the slices to show off its jewel-like interior. One of the best ways to fill Half Your Plate (and all of your soup bowl) is with a simple pureed soup. They’re a time-honoured and super-simple way to get a whole lot of vegetable flavour on the table in a hurry – maybe even hide vegetables from finicky eaters. 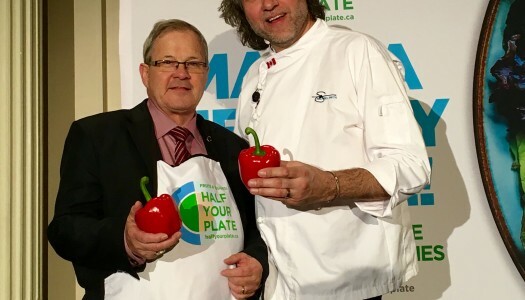 This one was custom created by the Honourable Lawrence MacAulay with Chef Michael Smith’s coaching! 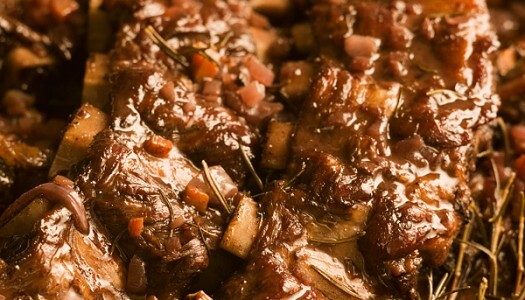 Short ribs are my favourite type of beef. No other cut has their rich beefiness and melt-in-your-mouth texture. Of course they do have to be slowly braised to release all that rich goodness, but that’s just more time to anticipate the treat to come!